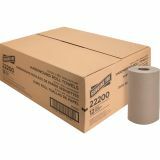 Carton of 12 rolls of hardwound rolls. Towels are made with 40 percent recycled material. 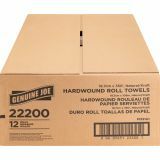 Genuine Joe Hardwound Paper Towel Rolls, 7.88" x 350", 12 Rolls/Carton - Hardwound Roll Towels offer a high capacity to provide storage space, maintenance and labor savings versus folded towels. 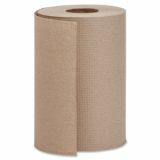 Heavily embossed to provide a better feel and aid in absorbency. 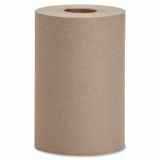 2" core size is compatible with most universal dispensers. 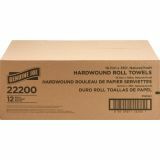 Perfect towel solution for high-traffic restrooms. Towels are made with 40 percent recycled material.